John Dale Brock, 90, went to be with the Lord on Tuesday, June 26, 2018, in Elkhart, Ind., at 10:30 a.m. at the Center for Hospice Care. Dale was born April 27, 1928, to Ira and Helen (Kane) Brock of Elkhart, Ind. He married Marian (Eminger) Brock on August 11, 1951. He is survived by his wife, Marian, and their three children, Beth Norman, Elgin, Ill., Linda Brock, Goshen, Ind., and David (Sandra) Brock, Nashville, Tenn.; three grandchildren and five great-grandchildren. Also surviving are his two sisters, Dorothy Riche, Council Bluffs, Iowa, and Louise (Tom) Bradley, Harpers Ferry, W. Va. Preceding him in death were his parents, Ira and Helen Brock, as well as his brother’s, Donald Brock and Lewis Brock. Dale grew up in Elkhart, Ind., graduating from Concord High School. He went on to graduate from Bob Jones University with a B.A. from the School of Religion. He also attended Grace Theological Seminary earning his M. Div. 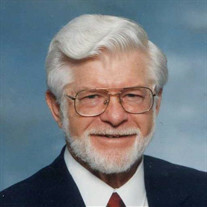 degree and then went on to the California Graduate School of Theology to receive his Ph.D.
Dale was ordained as a minister of the Gospel on March 3, 1957, at Bethel Brethren Church in Osceola, Ind. In 1946, he enlisted in the U.S. Navy and after college received his commission as an officer serving over 30 years as a Chaplain. He retired with the rank of Commander. His duties took him to California, Washington, Washington DC, Great Lakes, IL, Newport, RI, Vietnam and Yokosuka, Japan. After retiring from the Navy, Dale pastored churches in California and Washington. He served 13 years with CADENCE International, a mission organization to the U.S. Military. A memorial service was held Saturday, June 30, 2018, at Sugar Grove Church, Goshen, Ind. The Rev. John Ware officiated.